As I write, an Irish setter named Red lays on blankets. My partner and I can tell that he is afraid. We’ve lived with him for five years, and our best guess is that he is 12 years old. The family that fostered him told us he was seven the year he came to live with us. 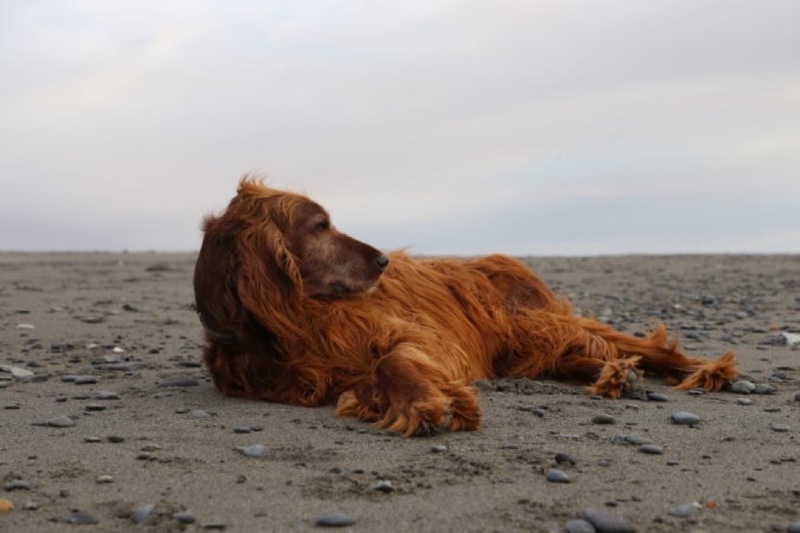 He weighed just 63 pounds, which gave him supermodel proportions, as he was the tallest Irish setter I had ever seen. The color of his fur is a royal red, and his long nose, ears that hang like locks of hair, and doe-like eyes give him the appearance of a noble creature – half horse and half wolf with a dash of red stag thrown in. “We have a hard time getting him to eat,” the woman who gave him to us said. It was after the last line that I stopped to think about Red’s condition again. He had fallen in the yard and, after making it to the shop floor, had not gotten back up. It had only been a few hours, but I had typed “was” instead of “is” and then corrected the error. Then I stared at the screen as my eyes filled with tears. Tonight, he is not with us anymore. I have a column due on the subject of rescue dogs as hunting dogs, I have work in the morning, and somewhere – because he can’t be gone – that lovely creature is roaming the heaven of places that must exist because we still feel the gravity of those who live there. We never had a hard time getting Red to eat. We were also told he barked a lot, and this was true. He barked orders for food, especially. But, he also barked when he wanted out or when he wanted attention. Those giant setter lungs could put out a bark so painful to the ears, he was impossible to resist. I’d like to think we were the first people who listened to what he was saying instead of making futile attempts to quiet him, and that’s one of the reasons we all got along so well. He preferred cooked food to chasing wild birds. When we took him to the grouse woods, he obliged to walk ahead of us and, if he got overheated, he laid his now 90-pound body of groomed red hair in the largest mud puddle or dirt pile. He was the woman in the million-dollar red satin dress jumping on the back of a motorcycle. Why? Because he was more beautiful than aspirations of beauty. And that’s how it looked to see him in the mud – damn beautiful.